Lions 4-167 (Quinton de Kock 109*, Jean Symes 20, Nick Beard 2-31) tied with Otago 7-167 (James Neesham 52*, Hamish Rutherford 32, Imran Tahir 2-28) Otago won the one-over eliminator. Lions scored 167 runs after losing just four wickets in the measured 20 overs and Otago thrashed even runs at the end of the required over with three wickets remaining. James Neesham (Otago) was declared ‘Player of the match’ for his astonishing unbeaten knock of 52 off 25 balls. The 14th match of the Champions League Twenty20 in Group A was played on Sunday, September 29, 2013, at Sawai Mansingh Stadium, Jaipur. Earlier, Brendon McCullum, the skipper of Otago, won the toss and opted to field first. 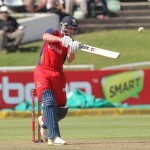 Rassie van der Dussen and Quinton de Kock came in to bat for Lions and scored just five runs in the first five overs. The latter hit 3 fours in the next couple of overs and der Dussen hit the first six of the innings but was gone for 17. Temba Bavuma walked in next and they crept to 73 in 11.5 overs when he was stumped by Derek de Boorder off Nick Beard for 13. The captain of Lions, Alviro Petersen, was declared leg before wicket off Beard for a duck as Jean Symes walked in the center. Quinton de Kock rushed to his seventh Twenty20 fifty in the 15th over with 1 six and 1 four and instantly changed his gears. He dispatched 3 lofty sixes and 3 fours in the next two overs and Symes tasted one six as well. The fourth wicket went down at 149 in 18.1 overs when the latter lost his wicket for 20. Quinton de Kock powered his second Twenty20 century in the final over and secured his end for 109 off 63 mere balls with 5 towering sixes and 10 fours. 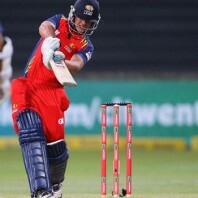 Dwaine Pretorius was at the other end for two as Lions amassed 167 runs with six wickets in hand in 20 overs. 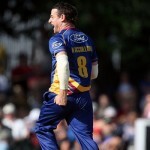 Nick Beard was the most successful bowler with two wickets whereas James McMilland and Neil Wagner shared one wicket each. Otago surrendered their two top order batsmen for just 27 runs in 3.2 overs. Neil Broom and Brendon McCullum went back to the dressing room for 6 and 5 runs as Hamish Rutherford along with Derek de Boorder tried to establish the innings. The boundaries started coming in at regular intervals and the batsmen added 1 six and 5 fours until the end of the 9th over. Rutherford hit 1 six and 1 four in the next one but was caught behind by de Kock off Imran Tahir for 32 from 21 balls with 2 high sixes and 3 fours. The bowlers of Lions got hold of the situation and picked up two quick wickets in the process. Derek de Boorder became the fifth victim at 101 in 13.4 overs at his personal score of 32 off 37 with 4 fours. Otago was in trouble at 6-103 after 14.4 overs when James Neesham and Ian Butler got their team back in the game with an eventful batting. The latter hit a six in the 16th over whereas Neesham punished Lonwabo Tsotsobe for 17 runs in the next one with 1 six and two back to back fours. The partnership was extended to 136 when Butler was clean bowled by Sohail Tanvir for 9 runs. Neesham carried on with his assault by hitting the boundaries at will and smashed his second Twenty20 half century with a grand six on the first delivery of the last over. Neil Wagner ran for a bye on the last ball of the 20th over as Otago smashed 7-167. James Neesham held his end for a brilliant 52 off just 25 comprising 4 giant sixes and 2 fours. Imran Tahir and Lowabo Tsotsobe were the highest wicket takers with two each whereas Sohail Tanvir, Ethan O’Reilly and Hardus Viljoen got one wicket each. The encounter ended as a tied but Otago was declared the winner on the boundary count while considering both innings (20 overs + Super over). Otago hit 19 boundaries (Sixes and fours) as compared to 18 from the blades of the Lions batsmen.